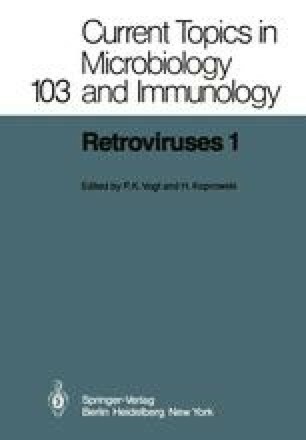 Endogenous viruses are defined as germline genes that code for the components of a retrovirus. These genes are present in all cells of all tissues of an animal and are inherited by progeny in a Mendelian manner. Two general methods have been used to detect the presence of endogenous viral sequences in DNA of a given species. First, sequence homology with the genome of a known retrovirus can be demonstrated for the chromosomal DNA. Second, production of viral particles or viral components can be demonstrated for cells of the species. The first evidence for the existence of endogenous viruses came from studies on spontaneous leukemia in the murine system (for review see Gross 1958a). There it was also shown that in lymphoid tumors induced by X rays, a murine leukemia virus was produced which caused similar tumors when injected into unirradiated mice (Gross 1958b; Lieberman and Kaplan 1959). Endogenous viral genes have now been shown to be essentially ubiquitous in vertebrate species including man. The purpose of this article will be to describe and discuss the current state of information with respect to the endogenous viral genes of the domestic chicken, Gallus gallus. We will discuss DNA structure, gene products, and some current ideas about the relationship between endogenous viral genes and disease.